Jack Nannie, assigned as the Key Club International Trustee for 2017-18! 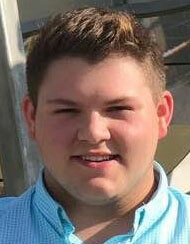 My name is Jack Nannie, and I’m from the Illinois-Eastern Iowa District. 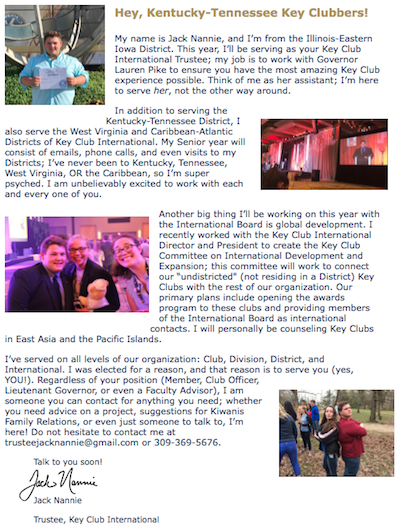 This year, I’ll be serving as your Key Club International Trustee; my job is to work with Governor Lauren Pike to ensure you have the most amazing Key Club experience possible. Think of me as her assistant; I’m here to serve her, not the other way around. In addition to serving the Kentucky-Tennessee District, I also serve the West Virginia and Caribbean-Atlantic Districts of Key Club International. My Senior year will consist of emails, phone calls, and even visits to my Districts; I’ve never been to Kentucky, Tennessee, West Virginia, OR the Caribbean, so I’m super psyched. I am unbelievably excited to work with each and every one of you. Download your copy of the Trustee update!